When you decide to go deer hunting, Texas has regulations just like all other areas of the country. Before you strike out on the path to bag a buck or two, you should be familiar with the states regulations on deer hunting. Texas is quite strict, and though hunting is a popular sport and a way of life in the state, violation of laws can really put you in a fix. Firearms: In deer hunting, there are a few regulations as to what firearms you can use. Rimfire ammunition of any caliber is not allowed in hunting whitetail, mule deer, or antelope of any kind. Pellet guns, air guns, fully automatic firearms, and silencers are illegal in Texas for deer hunting. Hunting Hours: During open season shooting hours for all game begins half an hour before sunrise and ends half an hour after sunset. For more exact information on these time periods for deer hunting, Texas has its published sunrise/sunset times on the internet. Hunting Season: For various types of deer hunting, Texas has separate seasons. For example, pronghorn antelope may be hunted (by permit only) for one week, usually the first of October (in the 2006-2007 season this was between September 30 and October 8). Whitetail deer ranged, depending upon location in Texas, between the end of October and the middle to end of January. Mule deer season was also varied by region, with archery allowed from the end of September to the end of October, and open season lasting between the middle of November and the first part of December. County Restrictions: Because there are areas in which it is illegal to discharge a firearm or even shoot an arrow, even when deer hunting, the many Texas counties should be researched for distinct restrictions. For example, you cannot possess, shoot or hunt with a firearm, bow and arrow, or crossbow in land or water in the Aransas and Poesta Rivers in Bee County or in the state-owned riverbeds of McMullen and La Salle counties. These are just a few locations that are restricted, you should research further for a full list. Public Areas: Texas has regulations regarding certain public areas. In designated Public Hunting Areas, all hunters must have a permit. Hunting is also illegal in any wildlife sanctuary, national, state, or Federal Park or refuge, discharge a firearm or hunt on a public road, or any area designated as a propagation or nesting area. 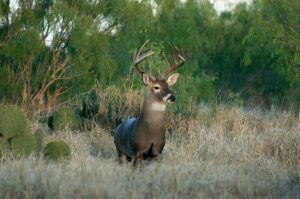 Harvest Rules: In Texas hunters have to abide by rules and are required to immediately log in ink the kill of a whitetail on the back of the hunting license for purpose of report. However, completion of such paperwork is not needed for mule deer or whitetail taken under special permits (such as MLD permits). Some counties need a specific sized antler to harvest a deer, and these regulations are firm regarding the distance between the points of the antlers. Check regulations in each county in which you will be participating in hunting season.